Hey hey! Today I have a long overdue renovation update. The construction work should be finished this week and then I can start putting the house back together. I want to say a big thank you to the guys at L&M Construction. They have done a fabulous job on our home and they are always such a pleasure to work with! If you're in the Southern NH or Northern MA area, definitely check them out. 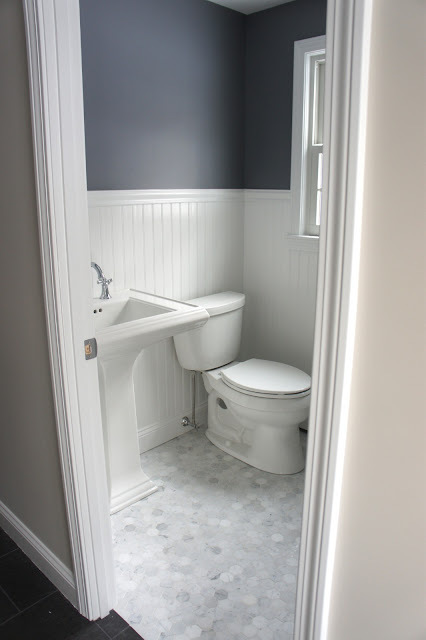 Yesterday, a new pedestal sink and toilet were installed and the bathroom walls received a couple of coats of Benjamin Moore Rock Gray. I selected the Kohler Memoirs Pedestal Sink, the Kohler Cimarron Toilet, and the American Standard Portsmouth Widespread Faucet in chrome. I decided to carry the beadboard above the countertop. I'm contemplating adding either shelving or art between the two cabinets to break up some of the white. I had the cabinet pulls kicking around so we installed them, but they're not my favorite. They will get swapped out at some point. I have a flush mount light fixture waiting to be installed in place of the lonely lightbulb. 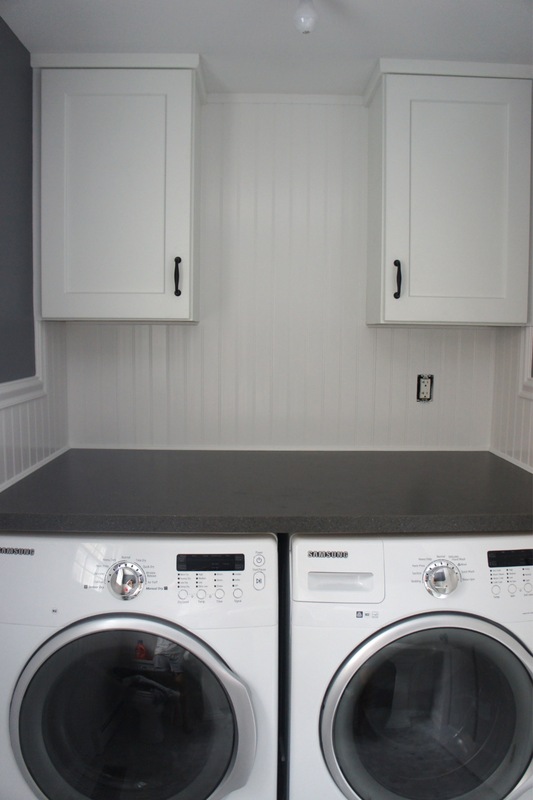 The washer and dryer fit pretty much perfectly under the new counter. I'm so happy that we decided to remove the closet. The small space feels so much bigger now. 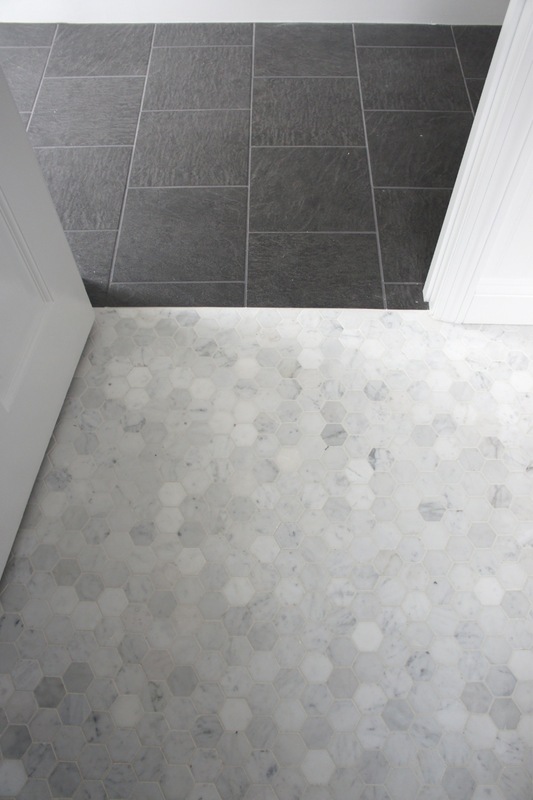 And of course, the hexagon marble floors are my favorite! They match really nicely with the gray tile we selected for the hall and kitchen. 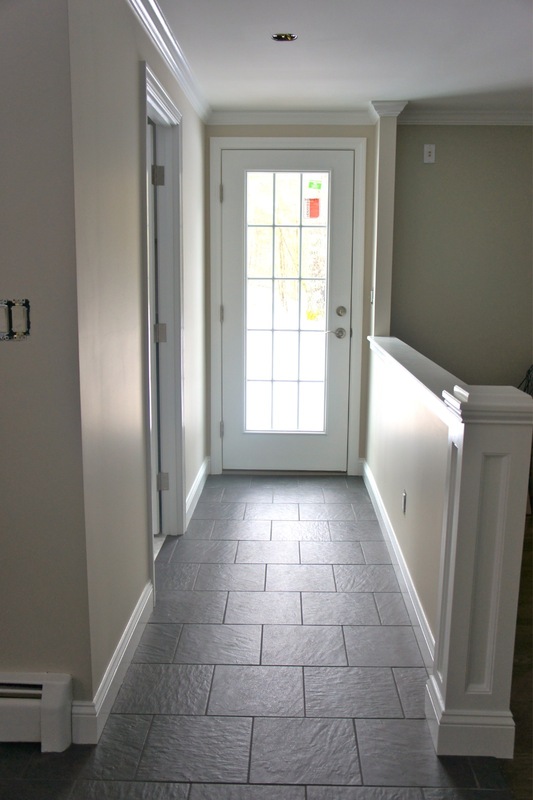 Here's another shot of the new french door and the hallway with the flooring done and walls painted. I chose Benjamin Moore Edgecomb Gray for the kitchen and hallway. It's a great greige color that changes with the lighting and other nearby colors. 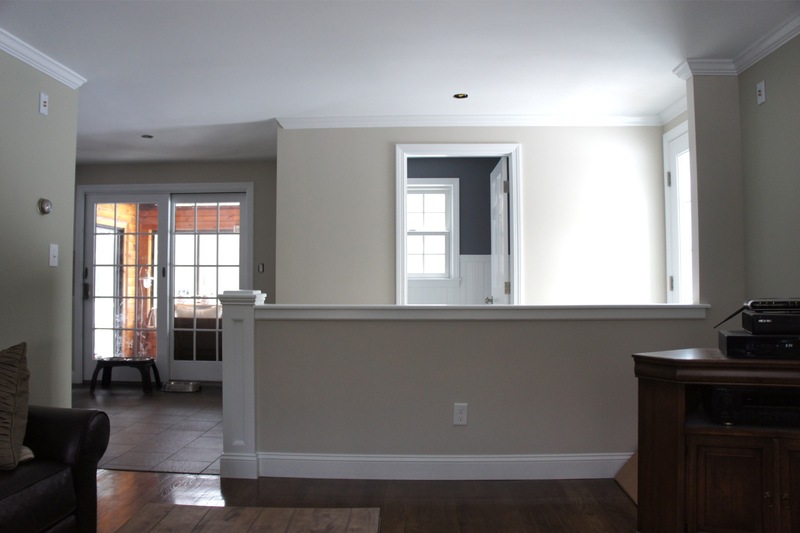 It plays nicely with the Benjamin Moore Spanish Olive that we used to paint the den last year. Here's the completed half wall. I love how it opens up the space! And here's a sneak peak of the kitchen with most of the cabinets done. 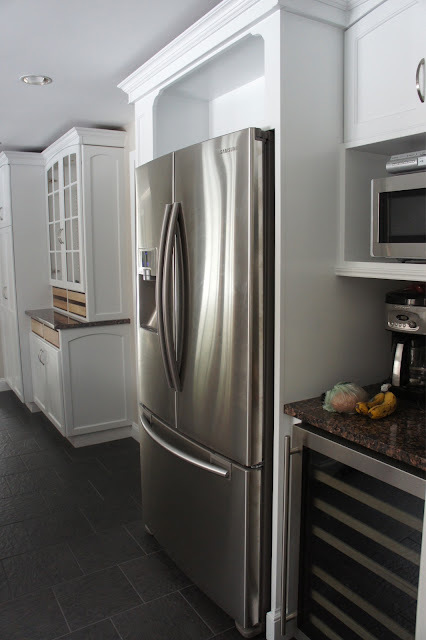 I chose Benjamin Moore Decorator's White for the cabinets. It's a bright white with a little gray tint to it. I can't wait to share the final product with you! Looks amazing!!! So clean! Love love love! I love it - it looks AMAZING! 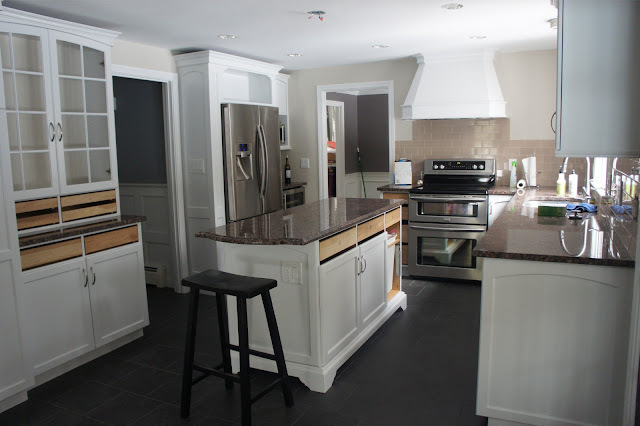 So jealous of your new kitchen - you do fantastic work! How do you like the tile butting up next to the wood floor? Wow! Everything looks beautiful!! That bathroom tile is wonderful! Jessica, it all looks fantastic! You must be so excited! Everything looks fabulous! That powder room is amazing! The transformation is amazing! Love the flow of the tile work and you made some great choices with the sink and faucet in the bath! I bet you can't wait to get it all situated and back together. Did you order the Hexagon Marble tiles online? Jessica, is that gray grout with the hexagon? I just had the same tile installed today and I'm a little nervous about the grout going in tomorrow. Thanks! Hi Rhea, we used white grout, not gray. Though, gray might look pretty cool! Jessica, is that gray grout in the hexagon tile? Thanks! Jessica, I was wondering if you would be able to tell me the dimensions of your bathroom/laundry room. Love the colors and décor!! Thank you!! The entire space is 5x8'6". Hope that helps! Hi, this looks nice. 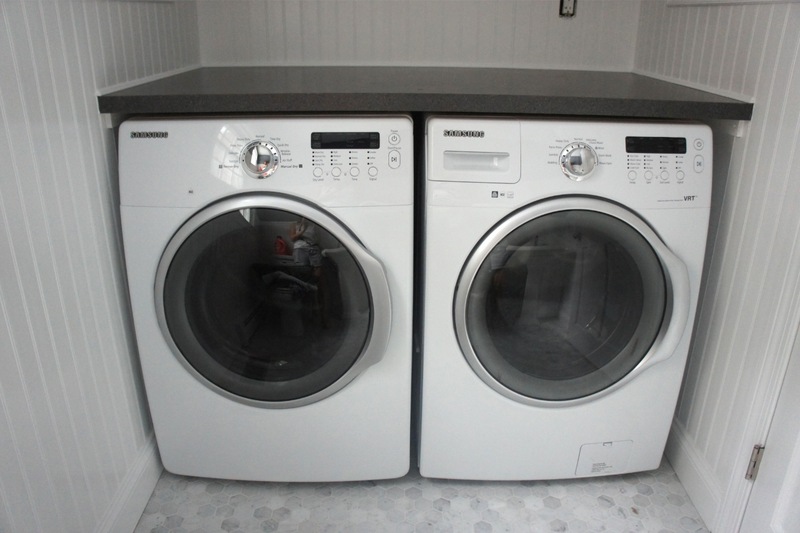 Can you tell me how you hooked up the water and drain line for the washing machine? We'd like to do something similar. jessica, i love the powder room/laundry room. where is that chrome light fixture from? i really like the chrome shades! Love it! 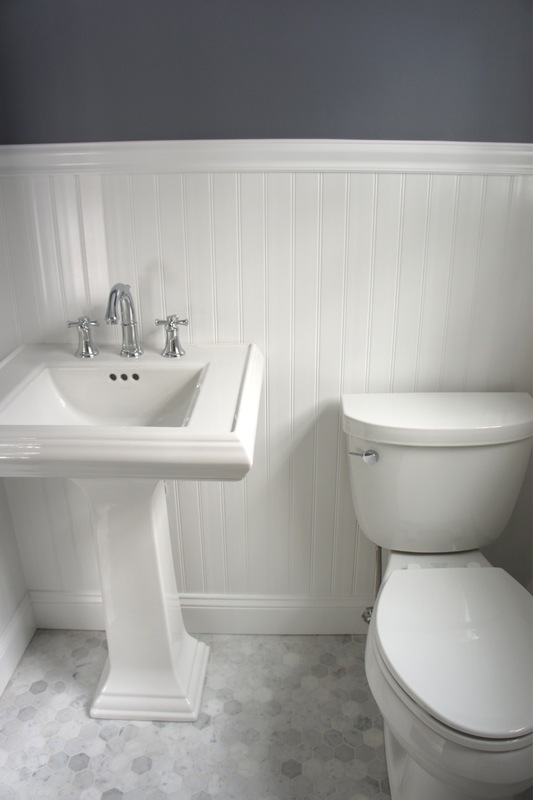 Where did you get the beadboard from and what material is it? Wow, beautiful!! Where did you purchase your laundry room cabinets? I need them!! I believe they are from Thomasville. http://www.thomasvillecabinetry.com I ordered them through my contractor. 1) what size mirror did you use- there are 2 sizes, reg and large in that model. 2) do you see any reason a same size kohler more round sink would work because of my limited space. 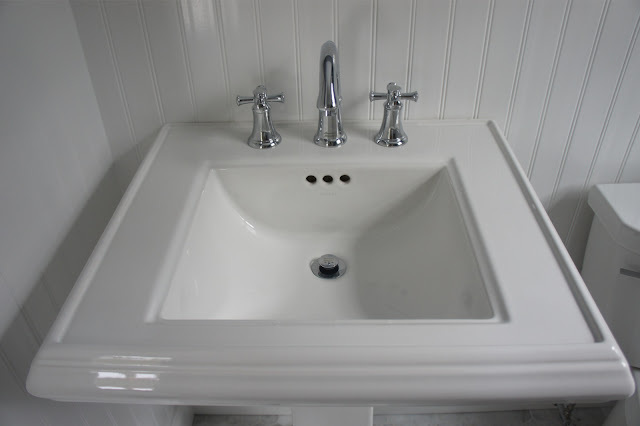 Or do you think the square sink Acually makes the room- also if I used the circle pedestal would I go with the oval mirror? I know it's preference but I'm asking for your eye on things. 3) how tall were your rooms. I have 8' ceilings and was wondering about placement, I can't find the lights available anymore in chrome, any other suggestions or were yours brushed nickle? 4) how tall was your bead board cut to? It looks above 48" but I wanted to check. Hi Charlie, sorry I am just seeing this. I don't live at that home anymore so I'm afraid I don't remember the exact details you are asking about. I hope your bathroom remodel turned out well!